An ocean (from Ancient Greek Ὠκεανός, transc. Okeanós ) is a body of water that composes much of a planet's hydrosphere. On Earth, an ocean is one of the major conventional divisions of the World Ocean. These are, in descending order by area, the Pacific, Atlantic, Indian, Southern (Antarctic), and Arctic Oceans. The word "ocean" is often used interchangeably with "sea" in American English. Strictly speaking, a sea is a body of water (generally a division of the world ocean) partly or fully enclosed by land,  though "the sea" refers also to the oceans. As the world ocean is the principal component of Earth's hydrosphere, it is integral to life, forms part of the carbon cycle, and influences climate and weather patterns. The World Ocean is the habitat of 230,000 known species, but because much of it is unexplored, the number of species that exist in the ocean is much larger, possibly over two million. The origin of Earth's oceans is unknown; oceans are thought to have formed in the Hadean eon and may have been the impetus for the emergence of life. The word ocean comes from the figure in classical antiquity, Oceanus ( /oʊˈsiːənəs/; Greek: Ὠκεανός Ōkeanós,  pronounced [ɔːkeanós]), the elder of the Titans in classical Greek mythology, believed by the ancient Greeks and Romans to be the divine personification of the sea, an enormous river encircling the world. The total mass of the hydrosphere is about 1.4 quintillion metric tons (7018140000000000000♠1.4×1018 long tons or 7018150000000000000♠1.5×1018 short tons), which is about 0.023% of Earth's total mass. Less than 3% is freshwater; the rest is saltwater, almost all of which is in the ocean. The area of the World Ocean is about 361.9 million square kilometers (139.7 million square miles),  which covers about 70.9% of Earth's surface, and its volume is approximately 1.335 billion cubic kilometers (320.3 million cubic miles). This can be thought of as a cube of water with an edge length of 1,101 kilometers (684 mi). Its average depth is about 3,688 meters (12,100 ft),  and its maximum depth is 10,994 meters (6.831 mi) at the Mariana Trench. Nearly half of the world's marine waters are over 3,000 meters (9,800 ft) deep. The vast expanses of deep ocean (anything below 200 meters or 660 feet) cover about 66% of Earth's surface. This does not include seas not connected to the World Ocean, such as the Caspian Sea. If a zone undergoes dramatic changes in temperature with depth, it contains a thermocline. The tropical thermocline is typically deeper than the thermocline at higher latitudes. Polar waters, which receive relatively little solar energy, are not stratified by temperature and generally lack a thermocline because surface water at polar latitudes are nearly as cold as water at greater depths. 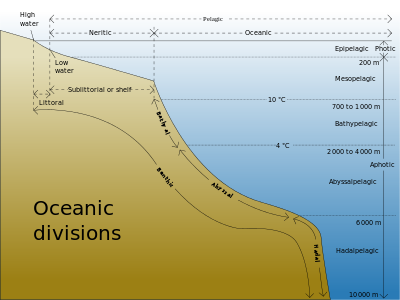 Below the thermocline, water is very cold, ranging from −1 °C to 3 °C. Because this deep and cold layer contains the bulk of ocean water, the average temperature of the world ocean is 3.9 °C. [ citation needed] If a zone undergoes dramatic changes in salinity with depth, it contains a halocline. If a zone undergoes a strong, vertical chemistry gradient with depth, it contains a chemocline. The deepest point in the ocean is the Mariana Trench, located in the Pacific Ocean near the Northern Mariana Islands. Its maximum depth has been estimated to be 10,971 meters (35,994 ft) (plus or minus 11 meters; see the Mariana Trench article for discussion of the various estimates of the maximum depth.) The British naval vessel Challenger II surveyed the trench in 1951 and named the deepest part of the trench the " Challenger Deep". In 1960, the Trieste successfully reached the bottom of the trench, manned by a crew of two men. Oceanic maritime currents have different origins. Tidal currents are in phase with the tide, hence are quasiperiodic; they may form various knots in certain places,[ clarification needed] most notably around headlands. Non-periodic currents have for origin the waves, wind and different densities. The Mars ocean hypothesis suggests that nearly a third of the surface of Mars was once covered by water, though the water on Mars is no longer oceanic (much of it residing in the ice caps). The possibility continues to be studied along with reasons for their apparent disappearance. Astronomers think that Venus had liquid water and perhaps oceans in its very early history. [ citation needed] If they existed, all later vanished via resurfacing. Theoretical models have been used to predict with high probability that GJ 1214 b, detected by transit, is composed of exotic form of ice VII, making up 75% of its mass,  making it an ocean planet. Other possible candidates are merely speculated based on their mass and position in the habitable zone include planet though little is actually known of their composition. Some scientists speculate Kepler-22b may be an "ocean-like" planet. Models have been proposed for Gliese 581 d that could include surface oceans. Gliese 436 b is speculated to have an ocean of "hot ice". Exomoons orbiting planets, particularly gas giants within their parent star's habitable zone may theoretically have surface oceans. Supercritical fluids, although not liquids, do share various properties with liquids. Underneath the thick atmospheres of the planets Uranus and Neptune, it is expected that these planets are composed of oceans of hot high-density fluid mixtures of water, ammonia and other volatiles. The gaseous outer layers of Jupiter and Saturn transition smoothly into oceans of supercritical hydrogen. The atmosphere of Venus is 96.5% carbon dioxide, which is a supercritical fluid at its surface. ^ Charette, Matthew; Smith, Walter H. F. (2010). "The volume of Earth's ocean". Oceanography. 23 (2): 112–114. doi: 10.5670/oceanog.2010.51. Retrieved 27 September 2012. ^ Spilhaus, Athelstan F. (July 1942). "Maps of the whole world ocean". Geographical Review. 32 (3): 431–5. doi: 10.2307/210385. JSTOR 210385. ^ Coble, Paula G. (2007). "Marine Optical Biogeochemistry: The Chemistry of Ocean Color". Chemical Reviews. 107: 402–418. doi: 10.1021/cr050350. ^ Deser, C.; Alexander, M. A.; Xie, S. P.; Phillips, A. S. (2010). "Sea Surface Temperature Variability: Patterns and Mechanisms" (PDF). Annual Review of Marine Science. 2: 115–43. Bibcode: 2010ARMS....2..115D. doi: 10.1146/annurev-marine-120408-151453. PMID 21141660. Archived from the original (PDF) on 2014-05-14. ^ Iess, L.; Stevenson, D.J. ; Parisi, M.; Hemingway, D.; et al. (4 April 2014). 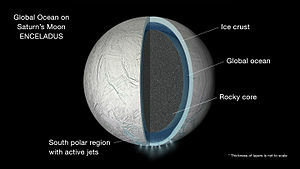 "The Gravity Field and Interior Structure of Enceladus". Science. 344 (6179): 78–80. Bibcode: 2014Sci...344...78I. doi: 10.1126/science.1250551. PMID 24700854. Retrieved 3 April 2014. ^ Wiktorowicz, Sloane J.; Ingersoll, Andrew P. (2007). "Liquid water oceans in ice giants". Icarus. 186 (2): 436–447. arXiv: astro-ph/0609723. Bibcode: 2007Icar..186..436W. doi: 10.1016/j.icarus.2006.09.003. ISSN 0019-1035. ^ Silvera, Isaac (2010). "Diamond: Molten under pressure" (Submitted manuscript). Nature Physics. 6 (1): 9–10. Bibcode: 2010NatPh...6....9S. doi: 10.1038/nphys1491. ISSN 1745-2473. ^ Vance, Steve; Bouffard, Mathieu; Choukroun, Mathieu; Sotina, Christophe (12 April 2014). "Ganymede's internal structure including thermodynamics of magnesium sulfate oceans in contact with ice". Planetary and Space Science. 96: 62–70. Bibcode: 2014P&SS...96...62V. doi: 10.1016/j.pss.2014.03.011. Retrieved 2014-05-02. ^ Ruiz, Javier (December 2003). 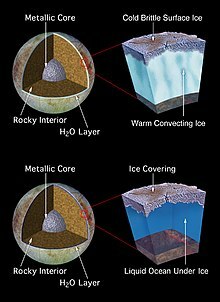 "Heat flow and depth to a possible internal ocean on Triton" (Full text). Icarus. 166 (2): 436–439. Bibcode: 2003Icar..166..436R. doi: 10.1016/j.icarus.2003.09.009. ^ a b Hussmann, Hauke; Sohl, Frank; Spohn, Tilman (November 2006). "Subsurface oceans and deep interiors of medium-sized outer planet satellites and large trans-neptunian objects" (PDF). Icarus. 185 (1): 258–273. Bibcode: 2006Icar..185..258H. doi: 10.1016/j.icarus.2006.06.005. ^ McCord, Thomas B. (2005). "Ceres: Evolution and current state". Journal of Geophysical Research. 110 (E5): E05009. Bibcode: 2005JGRE..11005009M. doi: 10.1029/2004JE002244. ^ Elkins-Tanton (2010). "Formation of Early Water Oceans on Rocky Planets". Astrophysics and Space Science. 332 (2): 359–364. arXiv: 1011.2710. Bibcode: 2011Ap&SS.332..359E. doi: 10.1007/s10509-010-0535-3. ^ Schaefer, Laura; Fegley, Bruce, Jr. (2009). "Chemistry of Silicate Atmospheres of Evaporating Super-Earths". The Astrophysical Journal Letters. 703 (2): L113–L117. arXiv: 0906.1204. Bibcode: 2009ApJ...703L.113S. doi: 10.1088/0004-637X/703/2/L113. ^ Atreya, S.; Egeler, P.; Baines, K. (2006). "Water-ammonia ionic ocean on Uranus and Neptune?" (PDF). Geophysical Research Abstracts. 8: 05179. Bibcode: 2005AGUFM.P11A0088A. ^ Guillot, T. (1999). "A comparison of the interiors of Jupiter and Saturn" (Submitted manuscript). Planetary and Space Science. 47 (10–11): 1183–200. arXiv: astro-ph/9907402. Bibcode: 1999P&SS...47.1183G. doi: 10.1016/S0032-0633(99)00043-4.